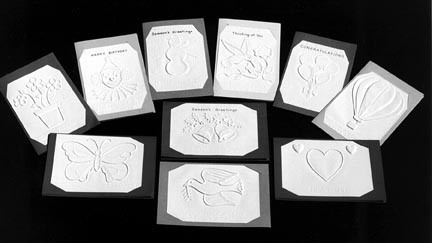 Write Your Own Personal Message in Print, Braille or Both! Attractive, high quality, illustrated CAL-tacTM Notecards are perfect to send to your family, friends or clients for all occasions. Because of the clarity of CAL-tacTM illustrations and grade II braille captions, everyone can identify and enjoy the pictures visually or tactually - without the need of an interpreter. Each 5"x7" card with white plastic CAL-tacTM illustration includes an envelope embossed with the CAL logo. Price: $2.75 each (U.S. Dollars). 10% discount for 10 or more. Add 10% for shipping and handling (USA).